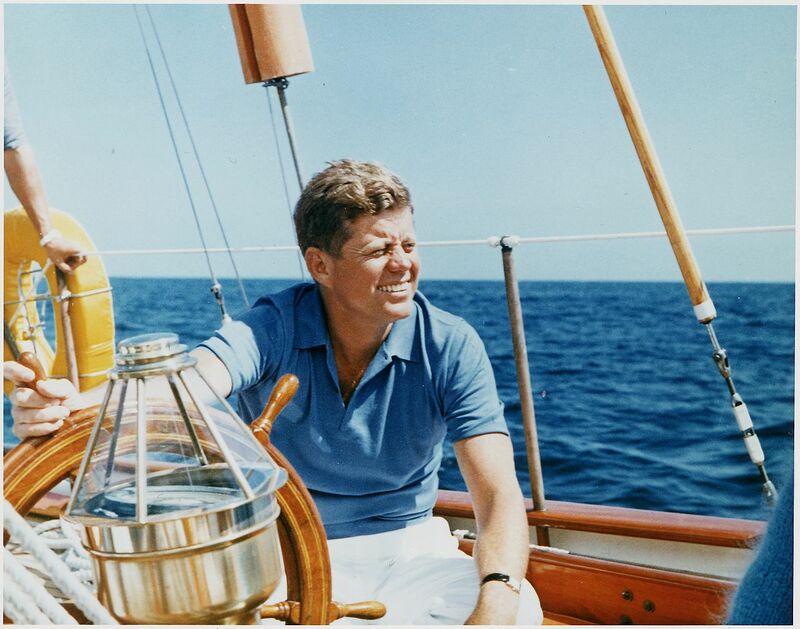 President John F. Kennedy and his family defined classic casual style, whether on the water at Hyannis Port, Massachusetts or in the rural Virginia countryside near Middleburg. 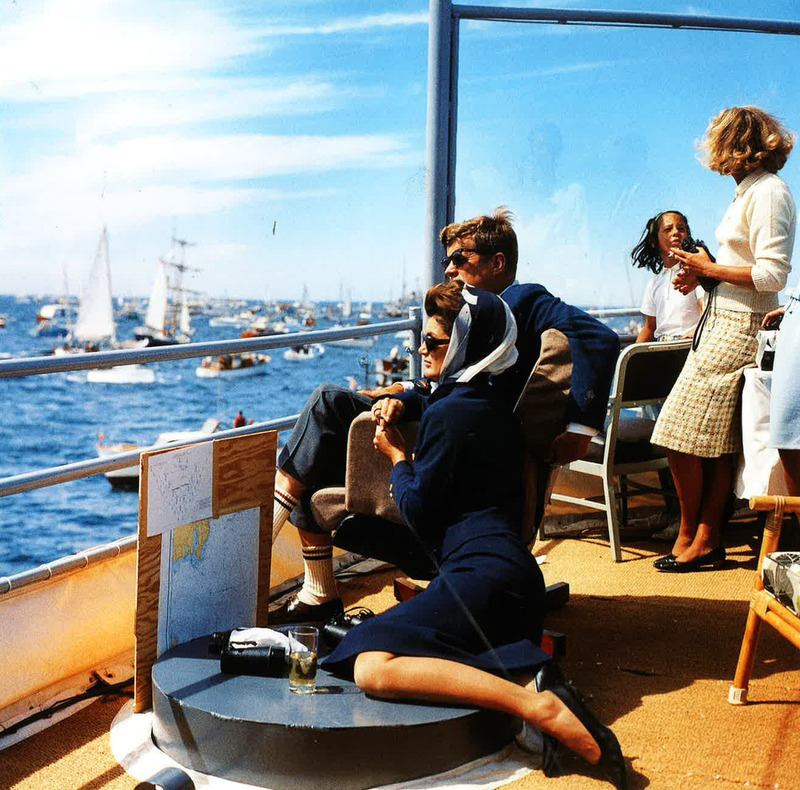 The home movie footage below captures the Kennedy sense of ease and comfort while at play. A few years ago on Ivy Style, Christian Chensvold published Jack and John: The Sartorial Dichotomy of JFK. This is an interesting essay on Kennedy’s use of clothing to build a public image that, in many respects, was a rejection of the conservatism of the Eisenhower era. Photographs of John F. Kennedy generally fall into two categories. In the first, we see him at his family’s Cape Cod retreat, sleeves rolled up, wearing khakis grass-stained from touch football, or clad in Nantucket Reds and sunglasses sailing the sea. In the second, his presidential kit, we see another man altogether. Kennedy’s dark suits hang with a certain awkwardness, the shoulders large and high, his two chest buttons both fastened. Though both are equally iconic, these two images of JFK reveal the sartorial differences between the man’s public and private lives. Privately he was the Choate and Harvard-educated scion of a patrician American dynasty, while publicly he was a progressive young Democrat, commander on the frontlines of the Cold War, and careful crafter of a public image in the new age of television. This schism makes JFK both the ultimate preppy president — his administration reigned at the height of the Ivy League Look — and an ironic hastener of the look’s decline, undermining the very style he so perfectly embodied. In 1956, while was serving his first term in the United States Senate, JFK made a bid for the Vice-Presidential nomination at the Democratic National Convention in Chicago. Although his bid fell short, losing to Sen. Estes Kefauver of Tennessee by just 38.5 votes, JFK became known as a rising star to millions of Americans. He spoke twice at the cenvention, placing Adlai Stevenson’s name in nomination for the Presidency and later giving a gracious concession speech (@ 23:41) after losing the Vice-Presidential nomination. Stevenson lost the general election that fall, as President Eisenhower was re-elected in a landslide. As Chris Matthews of MSNBC’s Hardball commented, “In the 1950s, politics meant men in gray flannel suits – guys like Dwight Eisenhower, Robert Taft, Adlai Stevenson, and Richard Nixon. They were dull, stodgy…sexless.” All of that changed in November 1960 when JFK was elected President at 43 years old, the youngest man ever to occupy the White House. 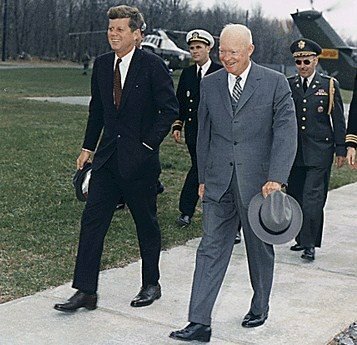 Aside from JFK’s political accomplishments during his tragically short term in office (1961-1963), he became one of the undisputed style icons of the 20th century. 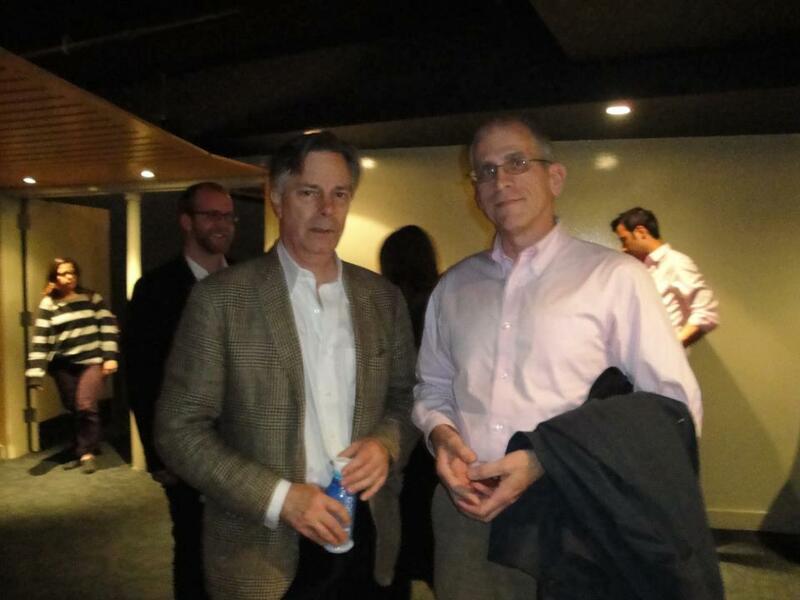 Going through my digital photo archive, I found a shot of me with director Whit Stillman (left) last May at the Landmark Sunshine Cinema in New York City. Whit was there for a screening of his most recent film, “Damsels in Distress,” and a Q&A session with two of the actors in that film, Ryan Metcalf and Carrie MacLemore. This was one of the last films I saw in the city before moving to South Carolina. After the Q&A, Whit stopped to chat with me for a while. He is one of my favorite directors, and has been known to indie filmgoers since the 90s as a chronicler of the “urban haute bourgeoisie.” Though his films lack a precise time or place, they do seem to capture the decline of mainline families, whose values and relationships seem hopelessly old fashioned, and an evolving and complicated set of social standards. His previous films Metropolitan, Barcelona and The Last Days of Disco have been referred to as somewhat of a preppy trilogy. Metropolitan (1990) remains my favorite of his films. The Last Days of Disco (1998) features an impressive Madras plaid sport coat worn by Chris Eigeman, who plays Des. Eigeman strenuously objected to being asked to wear the Madras jacket, but Whit won the debate. Making The Grade is another of the 80s preppy movies, but it was particularly bad, follwoing a cliche format of upper class collision with the lower class. What happens when Eddie Keaton (Judd Nelson), a streetwise kid from NYC, gets offered a boat load of money to pose as rich preppy Palmer Woodrow III (Dana Olsen) at an elite boarding school? Yep, you can see the sight gags and potential for misunderstanding a mile away. I’m afraid that the actors in this film were subjected to prepsloitation, but they accurately represent the look from that era. Satisfied with the setup, Stillman limped back to the monitor and slipped on a pair of headphones. “Rolling,” said Mikhail Sterkin, the sound man. Even the frat-house dolts who provide a counterweight of broad comedy — the character Thor can’t identify colors because he skipped kindergarten — aren’t belittled for their simple-minded aspirations. What Stillman captures best are people who aren’t quite adults but are no longer children: bewildered fledglings of beleaguered traditions who have a mostly abstract grasp of suffering, an often-preposterous belief in their own moral integrity and an optimistic faith that their destiny is part of a divine plan — ideally one of God’s. Stillman watched as Scene 24 unfolded on the monitor. The film’s main character, Violet, played by the lauded young star Greta Gerwig, was defending a guy at a bar who’d sent drinks over to Lily and another student. “Nonsense,” said Megalyn Echikunwoke, who was playing Rose with a fluty British accent. On the brink of action, Stillman spotted a hair malfunction on one of the actresses and sprang up to fix it, plantar fascia be damned. He began to plump one of the bunk-bed duvets. That glare on the top bunk — could someone black it out with a Sharpie please? And then he took after a fly on the set, trying to bat it out of the scene with some wild forehands. He limped back to the monitor, shaking his head. Nothing could be further from the truth, of course, but wry self-deprecation is one of the hallmarks of the well-bred WASP, and Stillman is a museum-quality specimen. Which you might expect of a man whose godfather, the sociology professor E. Digby Baltzell, always gets credit (inaccurately) for coining the term “WASP.” Even in unbuttoned Los Angeles, Stillman adheres to the preppy uniform of loafers, jacket and tie. He speaks briskly, carbonating his conversation with the same daft esoterica that bubbles up in his scripts — everything from the influence of Scrooge McDuck (“the only true role model for kids in rich families”) to the sexual practices of medieval French heretics known as Cathars. Stillman remains as adept at confounding expectations as he was in 1969, when, a Harvard freshman, he escorted a debutante to the Junior Assemblies ball at the Plaza Hotel in New York with a Students for a Democratic Society button tucked under the lapel of his white-tie-and-tails. His preferred place to write is Dunkin’ Donuts. He says he has no assets but finds having no assets to be “pathologically exhilarating.” His having no assets is, in and of itself, confounding given his lineage of prosperous sea captains, merchants and bankers, including his great-grandfather James Jewett Stillman, the president of National City Bank and one of the richest men in America when he died in 1918. The legacy left to John Whitney Stillman of Generation 10 was old-money culture minus the old money. Plus some inside material about the Stillman clan he used for his Harvard thesis, “Ten Families,” on the lack of dynastic control in American family-run companies. “Metropolitan” and “Barcelona” earned nice profits, but “The Last Days of Disco” lost a bundle. And yet you get the impression Stillman could live with “Damsels in Distress” languishing at the box office (the movie opens in New York on April 6) if the trade-off was that the “sambola,” which he and the choreographer Justin Cern created to fulfill Violet’s dream of starting an international dance craze, actually became an international dance craze. 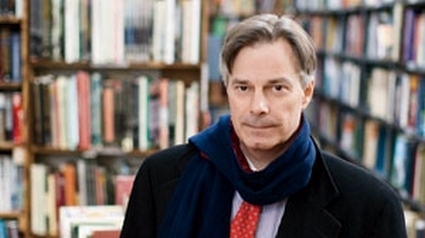 With his eccentric view of eccentricity, Whit Stillman resembles nothing so much as a character from a Whit Stillman film. He is the cast member who is obsessed with social codes and clichés, who covers hurt and hard feelings with a wicked wit. He may not, like so many of his characters, proclaim eternal devotion to principles he betrays 20 minutes later, but he does change his mind a lot and can be hard to pin down vis-à-vis deadlines and field trips proposed by journalists. He is a creature of comic contingencies and contradictions, not the least being that when he’s writing, he craves the society of the film set, and when he’s behind the camera, he covets the countertop at Dunkin’ Donuts. 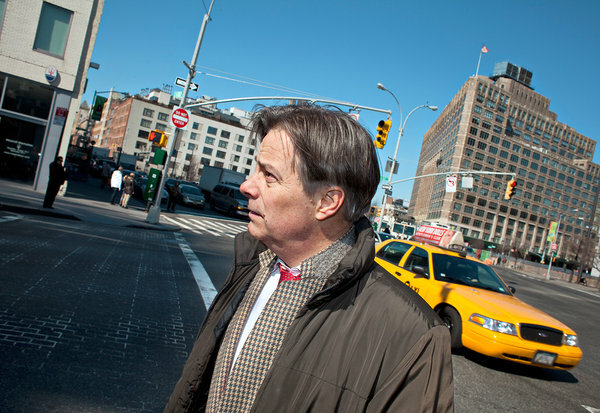 To continue reading, follow this link to Whit Stillman and the Song of the Preppy in The New York Times.